Are you selling your home? Let Accurate Home Inspection inspect it before you even list it. 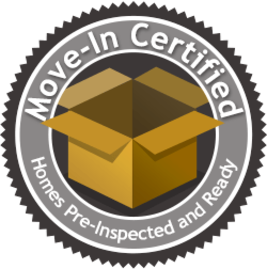 A Move-In Certified home has been pre-inspected, which means that the seller can confirm that there are no major systems in need of immediate repair or replacement, and no known safety hazards. A Move-In Certified Seller Inspection informs you of any defects or problems with your home so that you can address them before prospective buyers discover them. You can then take the time you need to obtain reasonable repair estimates. Show prospective buyers that you are dealing in good faith. Avoid 11th-hour negotiations and delays, and justify your full asking price by having your home pre-inspected now. Since the home has already been inspected by a Certified Professional Inspector this may prompt the buyer to waive thier own inspection contingency. And even if he doesn’t, a Seller Inspection means you won’t be in for any major surprises. A Move-In Certified Seller Inspection may alert you to any immediate concerns, such a broken pressure-relief valve or an active termite infestation. Lets you attach repair estimates or paid invoices to the inspection report. 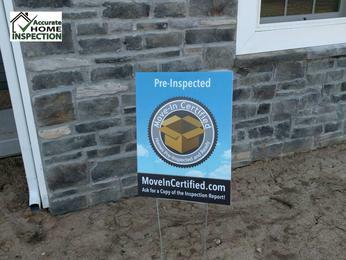 Move-In Certified yard signs will attract potential buyers touring homes in your neighborhood. A Move-In Certified Seller Inspection is the ultimate gesture in forthrightness on your part. A Move-In Certified Seller Inspection can help prevent 11th-hour re-negotiations and delays. A Move-In Certified Seller Inspection can reveal problems ahead of time. Gives the seller time to make repairs. Search for a home that has been pre-inspected. You can recommend an InterNACHI Certified Professional Inspector to inspect the home before the buyer’s inspector is hired. The inspection report will help your client see their home through the eyes of an unbiased third party, making them more realistic about their asking price. A Move-In Certified yard sign, provided by the InterNACHI inspector, will attract potential buyers looking for a home in the neighborhood. The inspection report can be hosted on www.FetchReport.com, which will entice potential buyers to tour other Move-In Certified homes. The Move-In Certified inspection report can be used as a marketing tool that goes beyond the seller’s disclosure. This kind of forthrightness is a great way to help sell the home and engage in a low-stress transaction. A Move-In Certified seller inspection report helps eliminate “buyer’s remorse” that can sometimes occur after the buyer’s inspection. With a pre-listing inspection, the facts are up front and there are seldom any new issues or surprises by closing.